The Sony Xperia Z2 was officially revealed at the MWC14 in Barcelona and this latest flagship from Sony had the event abuzz with fantastic hardware and top-end features. The impressive Sony Xperia Z2 has been pipped as one ofthe best smartphones of 2014 and when you take a closer look at this powerful phone you will see why. The Android 4.4 Sony Xperia Z2 has a 5.2-inch touchscreen display that has the first Live Colour LED display to feature on a smartphone. BRAVIA Mobile Engine technology (similar to that used on Sony TV’s) is on board too so you get a cinematic experience when watching movies and the Stereo speakers deliver impressive sound. The TRILUMINOS display technology gives a wider spectrum of colours so images appear richer and more natural. 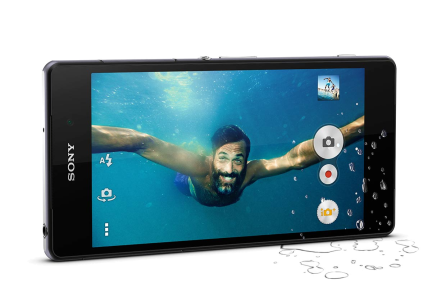 The Sony Xperia Z2 is IP55/IP58 certified making it tougher than your average smartphone with the ability to remain watertight for up to 30 minutes in up to 1.5 metres of fresh water (all ports and covers must be closed). The phone is also dust resistant so if you work in a tough environment the phone will not become clogged up with dust particles like other smartphones can. The impressive screen and numerous Sony enhancements are all powered along by a Qualcomm Snapdragon 801 quad-core processor for maximum power and even better battery life. Enjoy web surfing, streaming videos or using apps all at the same time and as the processor cores act independently for the right amount of power the battery lasts even longer. Gaming is impressive on this phone too as the Xperia Z2 is PlayStation certified and supports 3D gaming with the Adreno 330 graphics processor delivering a 20% better graphic performance. As you would expect from a top end smartphone the Sony Xperia Z2 has all the connection options you would need with 4G, 3.5G and Wi-Fi for connecting to the web and downloading apps at impressive speeds. NFC is quick and easy for sharing files between devices or connecting them to each other so you can see your photos on your TV or play music from your smartphone on a wireless speaker. The very latest Android KitKat is on board so you get the latest enhancements from Google as well as a whole host of apps pre-loaded as well as many more to choose from on Google Play. One of the most impressive bits of kit on the Sony Xperia Z2 is the built-in camera, and no wonder as Sony has packed the same technology into this little snapper that they use on their compact digital cameras. The large 1/2.3″ 20.7-megapixel Exmor RS sensor includes the award winning G Lens and BIONZ image-processing engine. All of these combine to deliver amazing photos in any lighting condition with the next-generation BSI light sensor reducing picture noise while still retaining a high resolution. The Superior Auto feature will adjust various settings for you so you don’t need to fiddle around with the camera to get a great shot and the Motion Detection feature speeds up the shutter for blur free images. Video is captured in stunning 4k resolution, which delivers four times the details of traditional Full HD 1080p video imaging so you get stunning detail and unmatched sharpness for your video clips. Sony has included tons of great apps for your images including Timeshift video that captures high speed clips at 120 frames per second and you can choose to slow down part or all of the video action. Background Defocus allows you to blur either the background or foreground of an image and Social Live lets you stream your images to your social networks. The Sony Xperia Z2 is now available for pre-order so you can place your order to be one of the first to get your hands on this amazing smartphone. You can enjoy all the 4G action on this mobile phone on a 4G contract from as little as £48 per month and for even more deals check out Mobilephones.com. What do you think of the Sony Xperia Z2? Would you buy this phone? Could this be the best phone of 2014? Tell us your thoughts by commenting below or join the conversation on Facebook, Twitter or Google+.